Wind energy is a significant source of power that is growing dramatically. The Department of Energy has set a goal for 20% of electrical energy used in the United States to be from wind power by 2030. Wind farms can be found throughout the world – from cold, arctic conditions to the tropics, from beaches to mountains to oceans. Understanding the basics of how wind energy is harnessed will prepare technicians, engineers, installers, designers, builders, and others that want to utilize wind technology in either large utility-scale turbine farms or small wind applications. Amatrol’s Wind Concepts Learning System (950-WC1) introduces learners to a broad range of basic concepts in wind energy technology. Learners study how wind power systems work and what it takes to generate electrical power with wind. Wind Concepts acts as a foundation for learners enrolled in wind-specific as well as general renewable energy programs. Siting a wind farm or turbine is vital. Utility-scale wind turbines cost several million dollars and the wind available at different heights varies tremendously, so understanding how much energy you can produce from the turbine in a specific location is imperative. 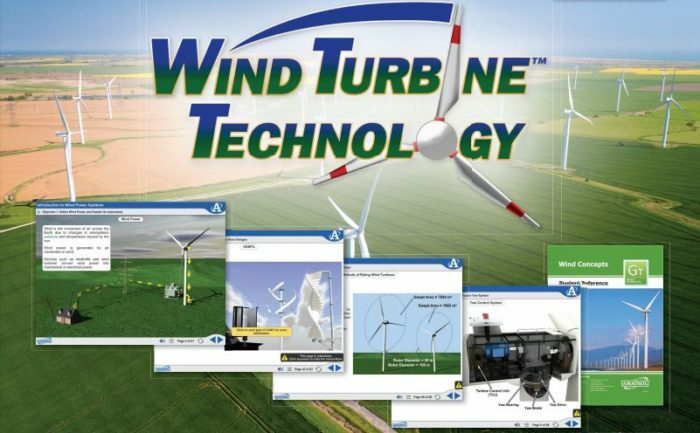 With Wind Concepts, learners gain knowledge and skills in applying science and mathematical skills to the variables involved in the critical turbine siting decision. Wind power is harnessed by a broad array of wind power systems. The most striking difference is between residential or small wind and utility-scale turbines. While each have their place in the energy landscape, they are very different in both application and design. Understanding the fundamentals of these various systems and how they are used is a good base from which to launch a strong knowledge of wind power. Amatrol’s Wind Concepts teaches learners about the range of wind power systems and how they are applied. Amatrol’s unmatched multimedia utilizes text, audio, and stunning 3D animations that engage learners in both theoretical knowledge and hands-on skills. This thorough, exceptionally detailed curriculum is built to begin with the basics and steadily advance to more complex concepts and skills. Through partnerships with key industry leaders and leading-edge educators, Amatrol developed the perfect balance of knowledge and applied skills needed to train learners to work in their chosen field. A sample copy of this course’s Student Reference Guide is included with the learning system. Sourced from the multimedia curriculum, the Student Reference Guide takes the entire series’ technical content contained in the learning objectives and combines them into one perfectly-bound book. If you would like to inquire about purchasing additional Student Reference Guides for your program, contact your local Amatrol Representative for more information.